The Calana White Gloss and Glass Dining Table really is a stunning piece. With its tempered clear glass legs, the white high gloss table top has almost a floating appearance, creating a very modern look for your dining room. 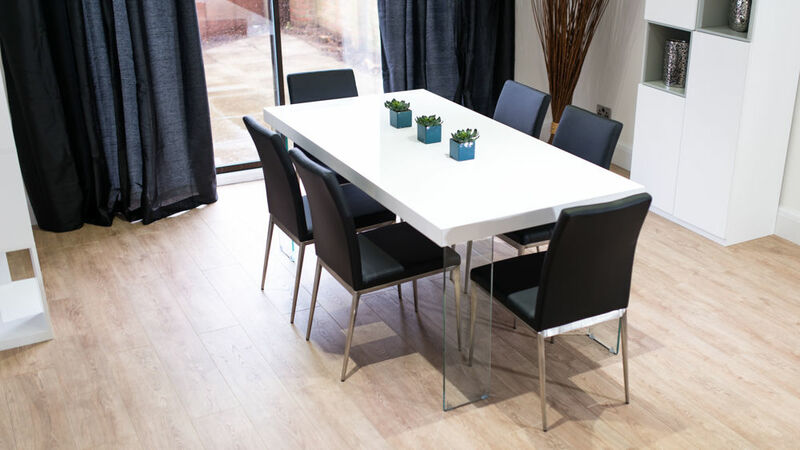 The white gloss and glass finishes also keep this table looking bright and spacious, making it a stylish place for all the family to gather round for dinner. 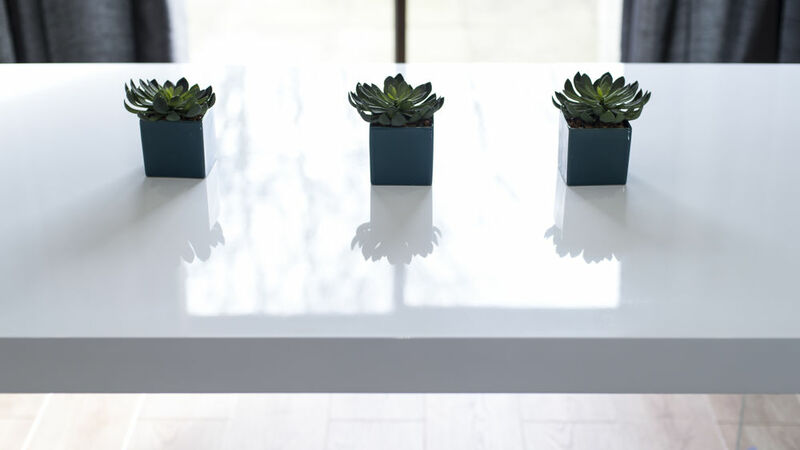 The table top of the Calana is a smooth white high gloss. This modern reflective finish, paired with the sleek clear glass legs, means the Calana table will add a bright and open feel to your dining area, creating the illusion of more space. 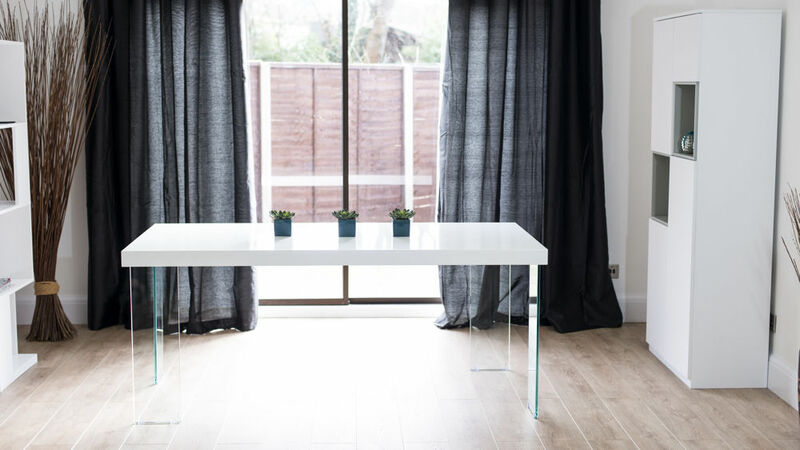 The contemporary white gloss table top is supported by 4 sleek glass legs at each corner. 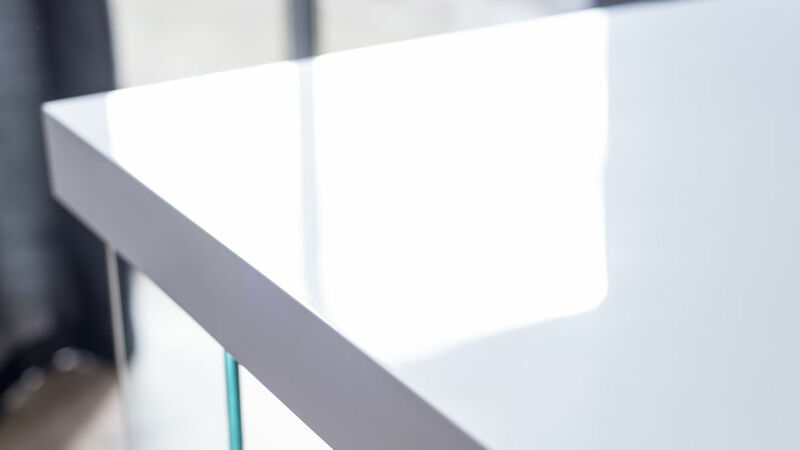 The glass used is strengthened tempered glass which has been certified to British Standard to ensure its durability and strength, meaning this table is incredibly strong, sturdy and very durable. This trendy dining table is 180cm in length 180cm, 90cm in width and 75cm in height. The sizing of the Calana combined with its space saving leg design means this dining table can comfortably seat between 6 to 8 people. This makes the table ideal for everyday dining and for those special occasions when you have more guests to seat. The Calana White Gloss and Glass Dining Table is also available in a grey oak finish if you are after a slighter warmer, less reflective table top. When looking for a stylish dining chair to match, the Calana looks wonderful paired with the Lucia Brushed Metal Dining Chair or the Lena Quilted Dining Chair. The Calanna White Gloss and Glass Dining Table really is a show stopper piece! Its beautiful tempered glass legs create an almost floating appearance, while the combination of the white gloss with the glass creates a modern and very fresh look. 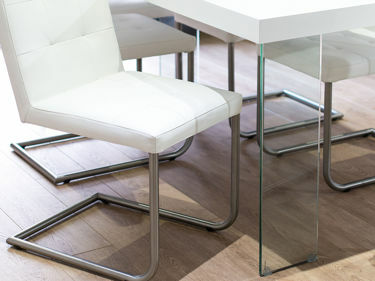 Having glass legs opens up the area around the base of the table, allowing you to really showcase your dining chairs while also maximising your space. The clever positioning of the glass legs means the Calanna table top is fully supported at each corner. 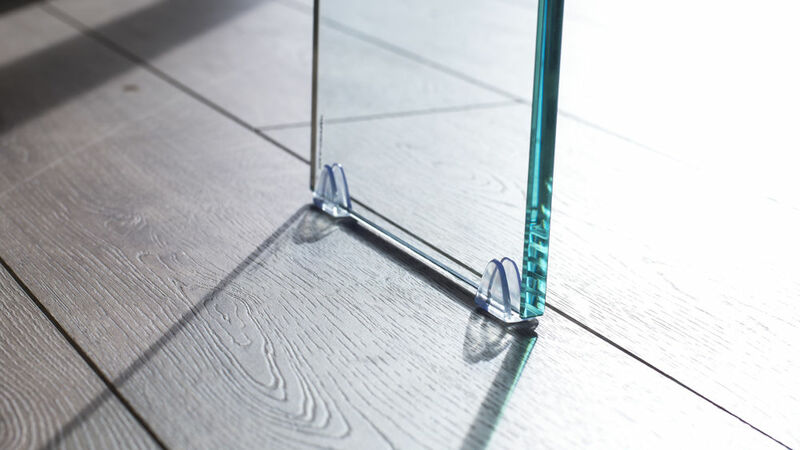 We've used strengthened tempered glass for the table legs as it's an incredibly strong, sturdy and durable material, giving you that extra peace of mind when buying a glass table for your home.